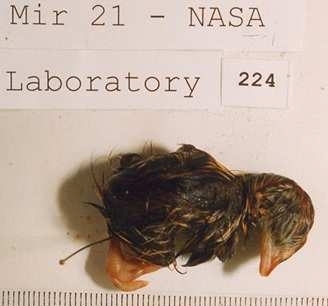 In the previous account of poultry in space, I related the story of how chicken embryos were launched aboard Discovery STS-29, but I did not make it to the story of birds (ex ova) in space. Despite claims to the contrary, someone did indeed try to launch birds into space, and the attempt was not a total failure. A few small and clumsy flaps for quails, quite a giant and sturdy flap for quail-kind and space aviculture! Japanese Quails (Coturnix japonica) have ventured to the final frontier; they have even hatched on Mir. These are the same species of quails about whom I wrote before, but do not worry: reproductive foam was not the subject of these investigations. Again, the eggs went first. * Japanese Quails were chosen as a candidate for a sustainable food source in space. Compared to other game fowl, the meat and the eggs are small in mass but potently nutritive. It seems that in nearly all Russian media that I consulted, the fact that quail eggs contain lysozyme, associated with immune system benefits, is rarely omitted, and quail eggs do boast a high protein ratio compared to the eggs of other edible game hens. Miguel et al. The first avian embryos in space were quail eggs taken aboard Soyuz 32 by Commander Vladimir Lyakhov and Flight Engineer Valery Ryumin in 25 February 1979. They allegedly requested construction of a portable incubator on Salyut 6.D.M. Harland Development of the quail embryos on Salyut 6 progressed more slowly than terrestial embryological development, and it was reported that the embryos were acephalous.R. Zimmerman Apparently, instrumentation failures could not be ruled out. The next batch of quail eggs, to go eggstra-terrestrial were launched in Bion 5/Kosmos 1129 on 25 September 1979, along with some rats and carrots, in an effort to study the effects of space flight in biological systems. The rings holding the eggs could be rotated in order to simulate egg rotation of natural brooding during preflight as well as in the synchronous terrestrial incubation. Most of the sixty eggs aboard Kosmos-1129 were damaged upon descent, and because the humidity control system malfunctioned, most of the embryos were dehydrated. Nevertheless, dissection of the one viable embryo revealed that weightlessness of space travel did not preclude normal development. On 6 December 1989, the Kvant-2 module docked onto Mir with a plethora of experimental equipment, including quail cages and Inkubator-1M. ** On 11 February 1990, Soyuz TM-9 launched with a crew of two: Commander Anatoly Solovyov and Aleksandr Balandin, flight engineer. Inkubator-2 arrives to Mir via the Kvant-2 module in 1989. Quail eggs were delivered to Mir later, on 3 March 1990 when Progress M-3, an unmanned Soviet cargo spacecraft docked. Commander Solovyov reported that he heard “писк” (equivalent of squeak sound). 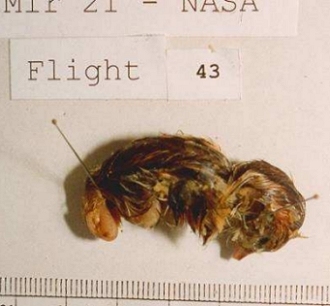 On 22 March 1990, day 17 of incubation (therefore, right on schedule), the first quail chick hatched in space. V.N. Sychev et al. And then another and another; in total, 8 of 33 quail chicks hatched. Contrary to the conflicting reports of Japanese Killfish being the first vertebrates born in space (they do get credit for being the first successful chordate breeders in space), Japanese Quails were, in fact, the first vertebrates to be born or rather hatched into the weightlessness of space. Meanwhile, back on Earth, one from the terrestrial synchronous control group hatched as well. T. Gur’eva et al. Commander Solovyov, in addition to holding the world record for spacewalk time, is distinguished as the first ever comsmo-aviculturist along with Balandin. In the film Belka, Strelka and others (Белка, Стрелка и другие, 2009), the famed spacewalking cosomonauts speak of helplessness and fragility of life just as would anyone who has ever faced the task of hand-feeding a songbird chick prematurely jettisoned from a nest. The chicks had to be fed every two hours, and their custodians were not prepared for the feeding schedule. The chicks, sadly, being so obviously unprepared for conditions of microgravity, were unable to feed themselves. Those who did not perish were euthanized, and all were preserved for study upon return to Earth.K. Bod’a et al. Not so precocial without gravity, are we? Back on Earth, Quails looked as if they had been "defeated" by microgravity. © Košťál et al. In the same year, four adult quails, one male and three females, were taken to Mir by Flight Engineer Genandy Strekalov aboard Soyuz TM-10. On that journey, one of the quails laid an egg during the shuttle ride to the the station which was sent back to Earth aboard Soyuz TM-9, and it turned out to be fertile; a chick hatched from it after incubation on Earth.K. Bod’a et al. In order to address the problem of mechanical fixation and leverage identified in the previous experiments, researchers designed “jackets” or “hammocks” in which quails could be harnessed in proximity to a feeder enabling them to feed independently.Košťál et al. Upon return to Earth, however, the quails exhibited general weakness and imbalance as well as a signature posture in which the head hung low and the spine arched upward. During the 7-day tour of weightlessness on Mir, though they could feed themselves, the quails seemed not to have an appetite for the spice of life. Researchers observed arrest of ovulation in the hens and a mutual “absolute apathy” to mating.K. Bod’a et al. Upon descent, researchers reported decreased testosterone levels, and dissection of two of the avian cosmonauts revealed dystrophy of the testes and ovaries. One of the hens of the flight covey was salvaged for reintroduction into the breeding flock. Within a week of the return flight, she laid eggs from which viable chicks hatched, proving that the adverse effects on reproductive organ morphology were reversible. More quail eggs were delivered to Mir aboard Progress M-15 on 29 October 1992.D.M. Harland Embryos were intercepted and fixed for study at critical intervals. Under the care of Commander Solovyov, veteran space avictulurist by then, six chicks hatched, but I could find no sources describing the condition of those chicks. They, or presumably their bodies, were returned to Earth as study material. In the race to send quails to space, Americans were not the victors, although they had dabbled with comso-embryogenesis of chickens in 1989. NASA did begin to participate in the quails in space effort in 1995 during Mir 18 and 19. Dr. Norm Thagard of the Mir 18 crew was the first American astronaut to handle quail eggs in space. NASA designed a fixative kit in order to facilitate onboard preservation of the emrbyos at different stages of development. By rupturing the shell, a 4% paraformaldehyde solution would diffuse into the egg thus fixing the contents for study. Post-flight analysis upon return via Atlantis STS-71 revealed that most of the embryos perished after the fifth day of incubation. The next “clutch” of space eggs were delivered via Atlantis STS-74 later in 1995. Under the gentle and care of Commander Solovyov of the Mir 19 crew and improved temperature and humidity control, more viable embryos were procured. The experiment was repeated a third time under the supervision of Dr. Shannon Lucid, biochemist turned cosmo-oologist and embryologist of the Mir 21 crew in 1996. NASA eventually developed their own incubation hardware, the “Avian Development Facility” which incorporated a programmable and automated fixiative function, launched aboard Endeavor STS-108. These images were taken from Prof. V. Sychev’s presentation (.ppt, 3MB) at a workshop on the role of dormancy in space exploration. The results of the quail embryogenesis experiments from 1990 to 1998 were confounding. Despite having demonstrated successful hatching of quails in weightlessness suggesting that gravity is not an essential force in the development of embryos, mortality rates were high.V.N. Sychev et al. Dr. Shannon Lucid scored the highest survival rate at about 60% in 1996, while in the other experiments during that time, the mortality rate was nearly 50% or more. The abnormalities associated with those fatalities included microphthalmia/anophthalmia, limb and beak deformation, displaced organogenesis, but these are the same complications that can be observed in terrestrially incubated eggs. Researchers posited that microgravity conditions perhaps exacerbated sensitivity to mechanical perturbation or temperature and humidity effects. At the left, quail eggs are displayed in a foam-lined transport case; in the center, a quail chick emerges from the incubation chamber, and at the right, there is a super-cute cosmo-quail. These are screenshots (via Boris Kovalenko, administrator of perepel.com) from Belka, Strelka and others (Белка, Стрелка и другие, 2009). The quail-relevant footage is viewable from 40:47 to 45:17. The next milestone of the quail space odyssey began in 1999 in a collaboration between Slovak Air Force and Slovakian academic institutes and Roscosmos and again IMBP led by Dr. Tamara Gur’eva. The research objectives of Experiment “Quail SK-6,” where SK is an acronym for “Slovak Cosmonaut” (Slovenský Kozmonaut), included embryogenesis and immediate ex ova development under microgravity conditions and post-embryological development under conditions of artificial gravity in Japanese Quails.V. Istomin Experiment “Quail” (Эксперимент «Перепел»/SK-6 Prepelica) was one of four experiments of a mission called “Štefánik” after Milan Rastislav Štefánik, Slovak astronomer, meterologist, and solar spectrographer (as well as diplomat and politican). With consideration of the setbacks related to humidity and temperature control experienced in previous missions, a new incubation system was designed. Sabo et al, 2001 The Transport Incubator SK-6-01 was a 7.5 kg thermally insulated container capable of hosting up to 60 eggs with such amenities as a ventilator, heater, and humidifier. After completing ⅔ of the incubation process on Earth, quail embryos completed the final trimester in space. From 17 to 22 Feb 1999, the inner temperature was maintained strictly at a cozy 37.3 ± 0.2 °C. Furthermore, the air flow also served to rotate the eggs mimicking egg-turning movement of the brooding hen during natural incubation. And that precision worked; on 22 February 1999, the crew heard a peep from the unhatched eggs. Using the newly developed space incubator, 12 of 56 eggs were dead-in-shell and 8 of 56 embryo fatally suffered from fractured shell. Therefore, the 64.29% hatchability in those five-star accommodations was eggsellent. In one source, it was mentioned that a chick hatched with four legs; therefore, this experiment did not serve to disclaim the high deformity rate observed in previous experiments. Ivan Bella was the research cosmonaut charged with aviculture duties on Mir, among other experiments. He was, by the way, the first (and thus far, listed as the only) Slovak cosmonaut. *** He could not have imagined that the most stressful moments of his experience in space would be in the diligent care of 36 quail chicks. The cosmo quails, young and old, were fed a paste-like suspension of dry meal in water; therefore, dehydration by inability to swallow water in microgravity was preempted. For hand-feeding the chicks, the members of the crew responsible for space aviculture duties used a squeezable tube from which to dispense the meal paste into or onto the tiny beaks. The quail chicks were again dependent on the crew for feeding. In this experiment, the chicks were subjected to artificial gravity in a centrifuge operating in the range of 0.3 g to 0.8 g, but it did not help. The centrifuge broke down only one day after the first hatch. Anyway, it was cool and dark, and the chicks raised therein seemed to suffer, as they were unable to access the food dispensers in their enclosures. As in the previous case of quail hatchlings in space, the traditionally precocial birds were rendered altricial by weightlessness. And sadly, some perished to undernourishment, despite handfeeding efforts of the crew. Ten surviving quail chicks were salvaged for return to Earth, but at only 10-11 °C in the transport chamber, seven perished likely to hypothermia. Col. Bella and Commander Padalka returned, via Soyuz TM-28, with three live quail chicks hatched in the cosmos. In private correspondence, Prof. V.N. Sychev wrote of those three quails who made it back to Earth that they eventually grew weak and died. So I surmise that there was no time for them to beget chicks to be presented as gifts to world leaders. I created a timeline highlighting the events leading up to this sensational return flight of Col. Ivan Bella and Commander Padalka with the trio that remained of the numerous cosmic quail covey. Considering that Slovakia participated as SSR, ČSSR, and ČSFR and that there was a time when cosmonauts were launched as citizens of one nation and descended as citizens of a another, 1,2,3 I chose to include in the timeline some notes on the status of nations. Somehow, it never before occurred to me that someone was taking care of birds in outer space during the fall of socialism in Czechoslovakia. On the top, space exploration progress relevant to cosmo-quails (or other poultry) and those who participated in the project are denoted. The events on the bottom half of the timeline reflect changes in structure of the participating formerly Soviet or Eastern Bloc nations. This is one from Col. Bella's covey. And that is the story of how Japanese Quails go down in history as the first ever feathered cosmonauts! *First, there was quail meat which technically counts as “ex ova” bird. In late 1988, quail meat was served on Mir by Commander Vladimir Titov and Flight Engineer Musa Manarov of Mir EO-3 in order to receive the crew of Soyuz TM-7. This feast perhaps set the menu precedent for dining with the French while in space. ** As I understand, the Slovakian collaborators referred to the incubation hardware aboard Kvant-2 as “Inkubator-1M”Sabo et al., 1995 (and this is even written on the logo of the device) while the Soviet and Russian collaborators referred to the experiment as Inkubator 2. There was reference made to another device called “NEST” that was used for housing post-hatch quails on Mir, but I was unable to find a complete description of the set up.K. Bod’a et al. ***While Col. Ivan Bella is recognized as the first Slovak citizen in space, Col. Vladimír Remek was, as part of the InterKosmos program, the first Czechoslovak cosmonaut. Although he was born in South Bohemia, he is half Slovakian by heritage and therefore entitled to Slovakian citizenship under Slovakia’s application of jus sanguinis. Anyway, that was in 1978, before the fun with quails in the cosmos began. ~ by finchwench on Tuesday, 6 September 2011. Excellent article! Everything heavy referenced! Thanks! The subject is both fascinating and sad. The poor little ones appeared terrified, and the description of the condition of the adults after they returned was disturbing.